Make bath time more fun with Little's Bath Tub in fun colours and designs.Babies love to splash around in water. Help your child enjoy every moment of their bath time with little's bath tubs. Get a baby bath tub for your little one in which he or she can splash around to their heart’s content and without getting hurt. 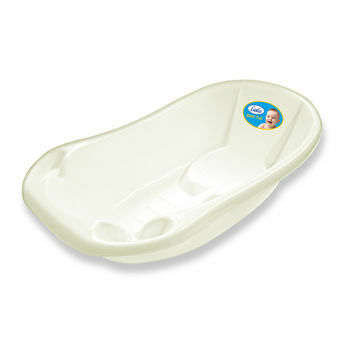 Little's bath tub are ergonomically designed and safe for babies to bath and enjoy at the same time. Ergonomically designed bath tubs in various fun colours and designs. Customized depression ensuring safe and convenient bathing for the baby. Lightweight makes easy to carry. Additional Information: Little's baby care products gives you an option to choose from a wide and extensive range of baby products and accessories for all parents to keep their baby happy, cheerful and comfortable.Little’s is one of leading brand of baby products in India with offerings for every life stage of a child from 0 to 4 years of age. The extensive range of products includes Feeding Bottles, Grooming and skincare products, travel gear, bath time products, toys, gifts and much more.All Little’s product are safe and made from best quality non-toxic material. Explore the entire range of Bath Time available on Nykaa. Shop more Little's products here.You can browse through the complete world of Little's Bath Time .